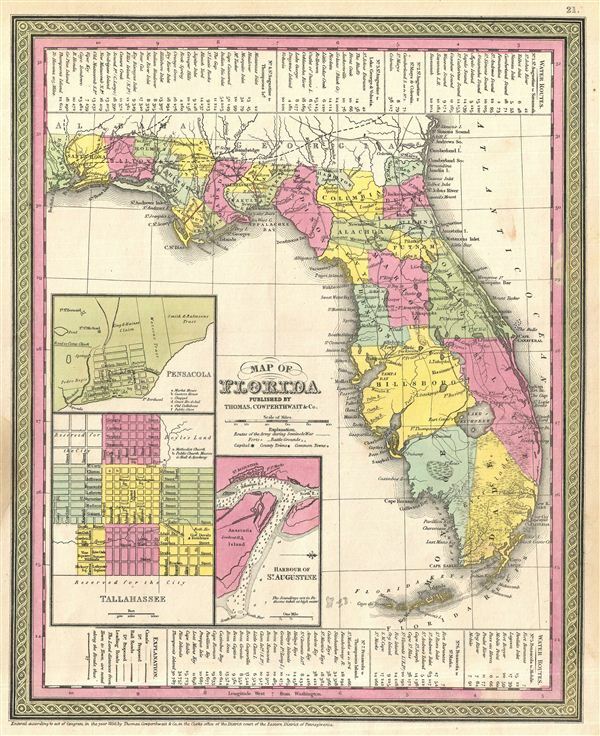 A fine example of Thomas Cowperthwait and S. A. Mitchell's 1854 map of Florida. Mitchell's map covers the entire state in considerable detail with towns, cities, counties, swamps, and reefs noted. Water routes and their distances from place to place are presented in tabular format at the top and bottom of the map. Three insets appear in the lower left quadrant: A town plan of Pensacola (with surrounding plantations), a town plan of Tallahassee, and a nautical chart of the Harbor of St. Augustine with depth soundings. The whole is engraved and colored in Mitchell's distinctive style with green border work and vivid pastels. Political and topographical features are noted and color coded with elevation rendered by hachure. Rumsey 0537.022 (1846 edition). Phillips (Atlases) 814.